In the conclusion to Wolf by Wolf, set in an alternate 1956 where Germany won WWII, Yael must deal with the consequences of her mission to assassinate the Führer, Adolf Hitler. After racing over 20,000 miles across Europe, Africa and Asia whilst wearing a face that isn’t hers, she must return to Germania without being caught by the SS and discovered as the skinshifter they are searching for. With resistance groups starting revolutions across the continent and SS members determined to keep control of the Third Reich, Yael must fight to see her mission through to the end, at whatever cost. Since finishing Wolf By Wolf with it’s ever so slightly evil cliffhanger, I always knew Blood For Blood would be a heartbreaker. How right I was. Blood For Blood kicks off immediately where Wolf By Wolf left off, with Yael attempting to flee Japan and return to Germania (the Berlin of this alternate Europe). 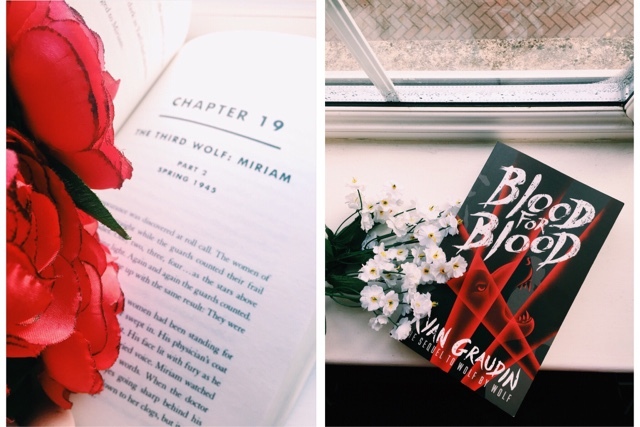 I fould Wolf By Wolf to be a very fast paced, plot based book, and Blood For Blood is quite the opposite – the plot is much slower for the majority of the book, and focuses a lot more on character and relationship building. However, this definitely isn’t a bad thing! Yael has always been a mysterious character, and remained so throughout Blood For Blood – I do feel as though I got to know her a lot better than I did in Wolf By Wolf though, and learning more and more details about her backstory in the labour camp was just heartbreaking. Not only did you learn more about Yael in this book, but she matured so much and learned how to control her emotions more. I adored her rash braveness in Wolf By Wolf, but the way she behaved in this book seemed much more fitting with everything that she went through in it. Although Yael faced so many challenges in Wolf By Wolf, none of them were really her facing her true fears, and in Blood For Blood she is confronted with challenges that are so much closer to her heart. Yael opens up to people so much and slowly starts to learn how to trust and love again and hey, even though she’s fictional, I am so proud of her. There isn’t all that much of an authentic romance in Wolf By Wolf (considering that Yael is impersonating someone else for the majority of it) but there is one in Blood For Blood, which after the events of Wolf By Wolf, does just seem to make sense. I’m so grateful that the romance was slow-burning, as well – it wasn’t forced or rushed into, and it developed at the right pace considering the events going on around the characters. As well as new characters, we’ve still got point of view chapters from characters from the previous book – Luka, everyone’s favourite badboy, and Felix, the grumpy German teddy bear. Both are fighting their own moral battles throughout and I just love how each character’s story played out and the way in which they all intertwined. I won’t say much about the ending apart from this – it broke me in more than just a couple of ways. This book just wouldn’t stop playing with my emotions, and I know that that ending will stick with me for a long time. If you’ve read Wolf By Wolf, you need to go and read this sequel right this second – and if you haven’t read Wolf By Wolf yet, what are you waiting for? What do you think of the Wolf By Wolf series? Let us know in the comments!